CM Magazine: Planet Ark: Preserving Earth's Biodiversity. (CitizenKid). 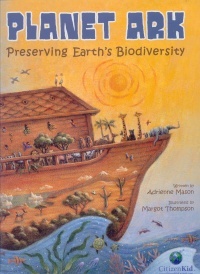 Planet Ark: Preserving Earth's Biodiversity. (CitizenKid). Adrienne Mason. Illustrated by Margot Thompson. Toronto, ON: Kids Can Press, 2013. Nature-Effect of human beings on-Juvenile literature. Suppose you were fixing your bike or mounting new wheels on your skateboard and found you had an extra bolt or screw left over when the job was done. Don't toss the "leftovers" away � you might regret it next time you're cruising down a hill. Sometimes things that seem to have no use can turn out to be important. This is one reason people are concerned about the loss of biodiversity. It is impossible to know what we are "throwing away" when we lose species and damage habitats. Perhaps a spaghetti-thin worm squirming through the soil might help digest a toxic pollutant, or a rare flower in the tropical forest could produce a valuable medicine. When we lose biodiversity, we also lose possibilities. Comparing Earth to Noah's Ark, and ourselves to Noah, is a clever way to invite a young reader to explore the complex topic of biodiversity. Planet Ark uses that analogy to describe how millions of species survive on the only planet known to have food, water and habitat for all. In the Introduction, the reader's attention is drawn to the fact that this biodiversity is seriously threatened, and that each Noah can play a role in helping to preserve it. If you are going to get involved with something so crucial as preserving biodiversity, you need to understand why. The book defines three types of biodiversity: species, genes and habitats. Then it describes how various species (and genetic diversity within species) contribute services such as pollination and decomposition to keep ecosystems humming along. Strong emphasis is placed on the idea of interconnectedness wherein the loss of a single species will affect the whole natural world. The page on "Saving Wild Places" explains that habitat loss is so critical that species unable to adapt to changes will be lost. Preservation of biodiversity starts with the soil and depends on maintaining healthy native species (and guarding against introduced species), not overharvesting, working to control global warming, and protecting vulnerable species in wildlife preserves and seed banks. Each aspect of this natural 'World Wide Web' is well detailed with specific examples: brown tree snakes accidentally introduced to Guam have destroyed native animals the ecosystem depended on; overexploitation of white rhino horns is believed to have left a mere seven animals in existence. On the success side, though, captive-bred black-footed ferrets are now being returned to the wild in the US and Canada. Beyond those species with which we may be familiar, maintaining biodiversity may lead us to new species, to sources of medicines, to jobs, to human rights (protecting food, clean water), and will continue to inspire the human imagination. A most interesting page is "Modern-Day Noahs": armed with an understanding of threats to biodiversity, the author offers numerous examples of ways young people are working around the world to protect it. An action as simple as providing containers for used fishing line can save marine mammals and fish from becoming entangled. Equally useful is the page of suggestions for getting involved: becoming a citizen scientist, keeping pet cats indoors, discouraging the use of toxic pesticides. Kids will know many of these ideas, but once they are fired up with the in-depth material in this book, the review draws it all together in a meaningful way. The author brings expertise as a biologist and researcher to present her case with extensive detail, comprehensible accessible language, and plenty of examples to which kids can relate. 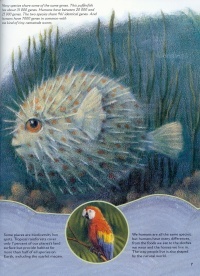 Often those examples are chosen to ensure readers will pause and think about the astonishing span of biodiversity: "In a world that has butterflies as delicate as tissue paper and cacti with thorns as long as your finger..." Explanations, which anticipate questions that may arise in a young mind, are well organized and thoughtfully written to lead the reader to clear understandings. The book design is pleasing with acrylic on canvas illustrations offering close-ups on species and habitats. The Ark theme is carried through on a 'watery' border at the bottom of every page showing inserts and facts that extend the detail in the main text. Readers might want to start this exploration of biodiversity with Tree of Life, a companion book in the "CitizenKid" collection that describes the classification of life on Earth. Then they'll be more than ready to investigate the importance of preserving biodiversity in Planet Ark and to plan their individual contributions to the cause.